EU foreign affairs chief Federica Mogherini says Jerusalem should be capital of 'two states,' as Netanyahu rejects 'settlement' criticism. The top EU diplomat appealed Saturday for the establishment of a "Palestinian state" as the killing of an Arab-Israeli by police fanned tensions following violent clashes in Jerusalem. 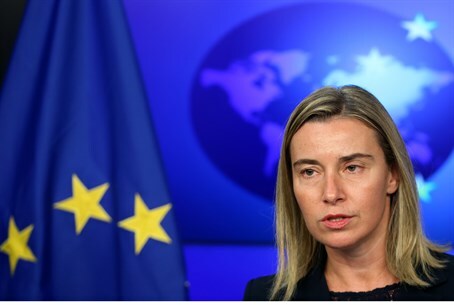 Federica Mogherini, the European Union's new foreign affairs chief, said the world "cannot afford" another war in Gaza, after donor states once again poured billions of dollars into a reconstruction program following the summer's war with Israel. "We need a Palestinian state - that is the ultimate goal and this is the position of all the European Union," Mogherini said during a trip to Gaza, devastated by its third conflict in six years. Speaking later to journalists in Ramallah, the top EU diplomat called for dividing Jerusalem. "I think Jerusalem can be and should be the capital of two states," Mogherini said, touching on a sensitive issue that has blocked peace efforts for decades. "Jerusalem is not just a beautiful city, the challenge is to show that Jerusalem can be shared in peace and respect," said Mogherini. "The message is not for the people who live here, the message is to the rest of the world," she said. "It is not a Palestinian-Israeli situation, it is a global issue." Palestinian Authority President Mahmoud Abbas said Saturday that a draft resolution was on course to be submitted to the UN Security Council this month calling for an end date for "Israeli occupation." The text is expected to be vetoed by permanent member the United States. Mogherini's visit comes against a backdrop of surging Israeli-Palestinian tensions in Jerusalem where there have been near-daily clashes in flashpoint neighborhoods. In the village of Kfar Kana in northern Israel, meanwhile, a 22-year-old was shot dead by security forces after intervening in the dawn arrest of one of his relatives, brandishing a knife, according to police. Dozens of angry youths later erected barricades and set fire to tires on the outskirts of the village as police deployed reinforcements. The shooting followed another night of clashes in east Jerusalem pitting youths throwing rocks, firebombs and firecrackers against police who used rubber bullets, stun grenades and tear gas. The violence was particularly intense in Shuafat, a hotbed of Arab extremism. The spike in violence came after a Shuafat resident plowed a car into pedestrians in Jerusalem on Wednesday, killing two people and injuring a dozen others before he was shot dead in the second attack of its kind in two weeks. Speaking on Friday during her first official visit to Jerusalem, Mogherini said there was a real "urgency" to pick up and advance the moribund peace process. She rounded on Israeli building in Jerusalem, Judea and Samaria, labeling it "an obstacle to peace." Shortly afterwards, Mogherini met Israeli Prime Minister Binyamin Netanyahu who gave a terse statement dismissing criticism of his building policy. "I reject the fictitious claim that the root of the continuous conflict is this or that settlement," he said. "Jerusalem is our capital and as such is not a settlement." Netanyahu ordered the security forces to either seal or demolish the homes of any Palestinian terrorist involved in anti-Israeli attacks, an official said Friday. Mogherini had been scheduled to meet PA prime minister Rami Hamdallah in Gaza but he cancelled his trip after a series of bombs there Friday hit the homes and cars of Fatah officials. Fatah, the party of Palestinian president Mahmoud Abbas, laid the blame on the Islamist movement Hamas, the de facto rulers in Gaza, as a new row broke out between the rival Palestinian factions. Hamas announced Friday it was forming a thousands-strong "popular army" in Gaza, in response to what it called "serious Israeli violations" at the Temple Mount.